Feel clean from head to toe. 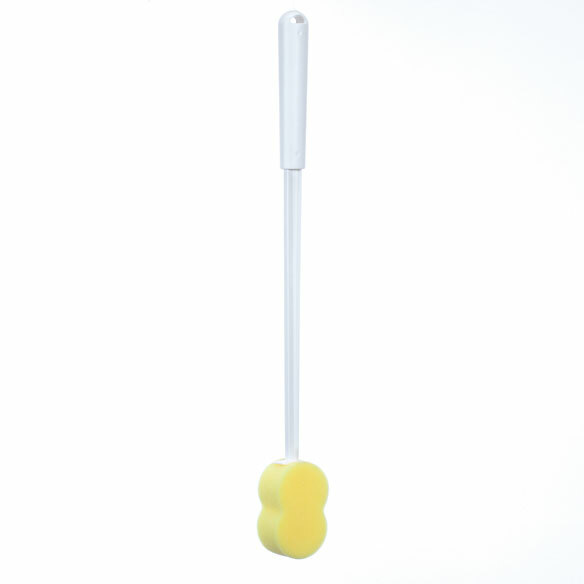 Easy-reach figure-8 antimicrobial sponge gently cleans hard-to-reach areas without bending or straining. Shower sponge helps eliminate bacteria and odors for long-lasting freshness. Perfect for those with limited mobility. Thick 5" x 2" antimicrobial bath sponge. This enables me to scrub my own back. As I get older is more and more difficult. Handle is very weak and flimsy. Bends when trying to apply the smallest amount of pressure. Making it impossible to thoroughly clean hard to reach areas. Length of handle is too long for short people with shoulder issues. Thank you for your review. We are sorry to hear the Easy Reach Sponge was received defective. Please contact our customer service by email at easycomfortscsr@silverstarbrands.com or by phone at 1-800-296-5174 and we can assist you further. We apologize for any inconvenience this may have caused. Because I need something to help reach my middle back! It was longer and I needed it after total hip replacement. it looks like it will do what I need. I needed a sponge with a handle that reaches all over my back. Hip problems make washing my feet in the shower very difficult. I have mobility problems and need a long handled soft brush to clean my back. Had shoulder surgery and need long arm brush to wash my back. To reach m;y back when I shower. I bought this before when I had my first hip replacement. It was indispensable to me, as you cannot bend and twist easily for 6 weeks. Decided to order both shapes for different parts of this old bod. I am no longer limber and need help getting to all the parts. I am having back surgery, and I can’t bend or twist to wash myself. So I can wash all of my back!! !